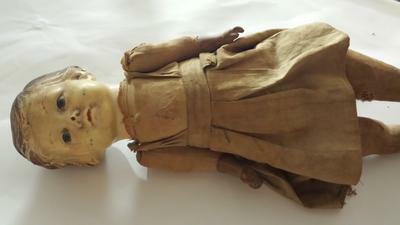 This doll belonged to my mother. She always said it was a valuable antique. We don't know much about it except what we can see. 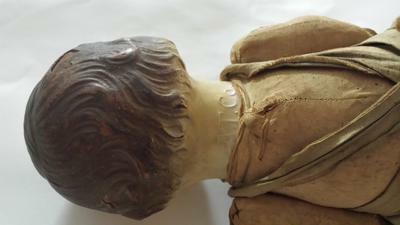 It's a jointed fabric-body doll with straw stuffing and plastic hands and head. The maker's mark on the back says "A.T. Co." and the dress appears to be removable, but we haven't tried. The arms are attached by a long metal nail that runs through the whole body, the right arm has the head of the nail and a washer, the other arm has the end of the nail which has been bent 90 degrees to hold it on. The legs are similar. There are clear mold lines on the sides of the head, and some damage on the top of the head. There is no fibrous hair, it's all one piece.